Emory University has been ranked 21st among the nation’s top universities in the new 2016 Best Colleges guidebook from U.S. News & World Report. "Emory has received wide recognition as an international leader in global research, discovery and innovation," says Claire Sterk, Emory provost and executive vice president for academic affairs. "We consistently rank high in a variety of national surveys that convey aspects of our identity, from the strength of our academic programs, to the quality of faculty teaching and research, to the value of an Emory undergraduate experience for students." Emory was listed as 18th among national universities offering the “best value” to students based on a combination of academic quality and the average level of need-based financial aid. The university also was cited for its economic diversity, with 21 percent of its undergraduates receiving need-based Pell Grants, and among schools with the largest percentage of international undergraduates at 15 percent. Emory also was ranked 16th among national universities that are the "best colleges for veterans," offering military veterans and active-duty service members "benefits that can help them make pursuing a college education more affordable." 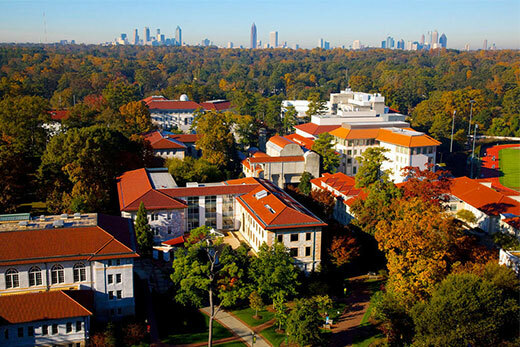 Emory has been cited as one of the world's top research universities (Leiden Ranking), having one of the best college libraries (Princeton Review) and being a best value among private universities (Kiplinger's Personal Finance, Princeton Review). The new 2016 rankings appear today at www.usnews.com.